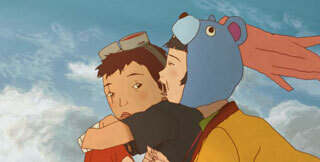 When I saw Tekkonkinkreet at Virgin Megastore with a friend, I completely dismissed it. The cover wasn't spectacular and the artwork didn't look pretty to me. "One of the Best Animes Ever!" it boasts right on the cover. My friend was wondering if he should pick it up; it was on sale after all. Considering we were already spending a fortune there, I said we can skip it for another day (I was actually hoping the ìanother dayî would never come and we didn't have to waste money on this DVD). Just in case he did want to watch it, I went and borrowed it from Netflix (yeah, I'm frugal and what?). When it came in, it sat in the junk mail section for three weeks and even then I was leery about watching it. The directorial debut of Michael Arias (yeah, he's a white guy directing an anime made in Japan and what? 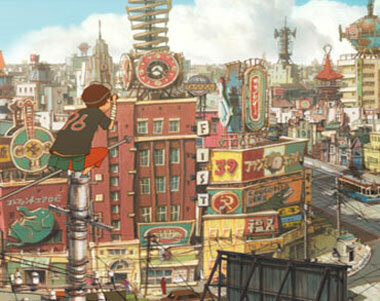 ), Tekkonkinkreet is his vision of how the original manga, Black and White, by Taiyo Matsumoto would look like with a facelift from the new century. 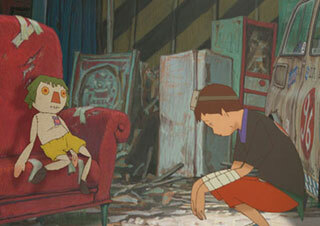 Treasure Town is ruled by a team of two orphans called, The Cats. The citizens, the Yakuza, and even the cops don't know it but everything is allowed to happen only because Kuro (a.k.a. Black) and Shiro (a.k.a. White) allow them to happen. Nothing gets by these two. Two new orphans from another neighborhood come in to take over the turf? Yakuza trying to muscle everyone out from Treasure Town? Cops trying to figure out why an old criminal is back in town? A strange business man that seems to be controlling all of this? This is Kuro's town, Shiro's and his town and no one is going to change it if he doesn't want it to change. As one of the cops say, don't ever think that Treasure Town is ever any one person's because that is when trouble begins. Everyone starts to notice the existence of The Cats. 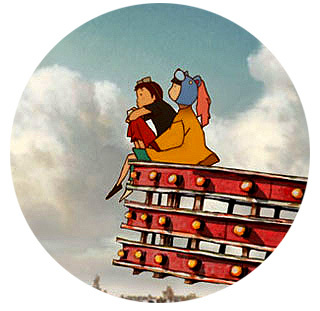 The citizens try to stay as far away from them as possible; orphans are trouble for everyone after all. The local street gangs and the cops are trying to protect them; they are only kids that have no idea what kind of trouble they are getting into by going against the yakuza. The yakuza are pissed off that they are sent in for something as insignificant as taking care of a pair of slippery annoying kids that some strange business man thinks controls everything that goes on in Treasure Town. When the yakuza is proving useless against The Cats, this man sends in these alien-looking assassins to take care of things. And the old criminal that has come to town? He wants to know why everything can't just remain the same for his old town. 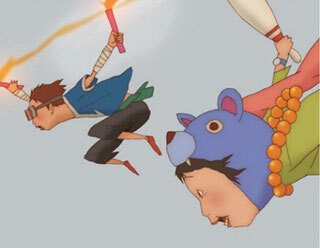 Below: A music video for Tekkonkinkreet featuring the song B-Blue by the band BOØWY. 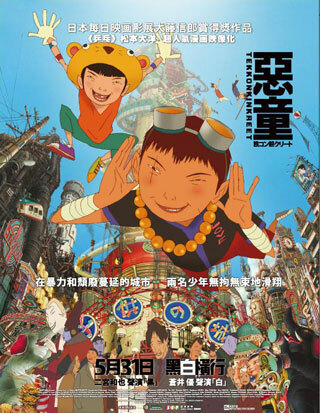 Below: The poster for Tekkonkinkreet.